The NC Wildlife Resources Commission stocks trout within its Public Mountain Trout Waters program. 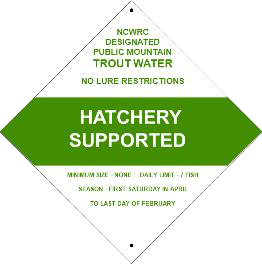 This page will help you find the schedule of upcoming stockings in either Hatchery Supported or Delayed Harvest Trout Waters, as well as a list of recently stocked waters. Use these resources to help you decide which locations to visit. You may also want to visit our Public Mountain Trout Waters Search for maps and listings of different waters by regulatory classification. Check back daily after noon for additional updates.